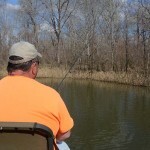 John’s Note: Steve Brown from Millbrook, Alabama, fishes the Alabama River as his home lake. 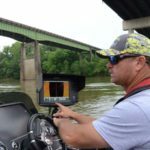 But as a professional crappie fisherman, Steve Brown fishes rivers and lakes all over the United States and shares what he’s learned that will help each of us be better anglers on rivers. He defines himself as a crappieholic. 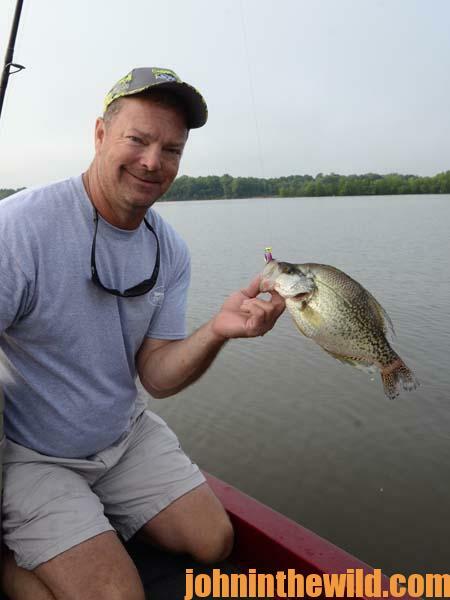 One of the secrets to catching summertime crappie is to keep your minnows alive and lively. I use a 120-quart Yeti (www.yeticoolers.com) cooler that I’ve drilled into the cooler through the drain plug. I run Pro-Air, a bubble system, through it to keep my minnows alive. 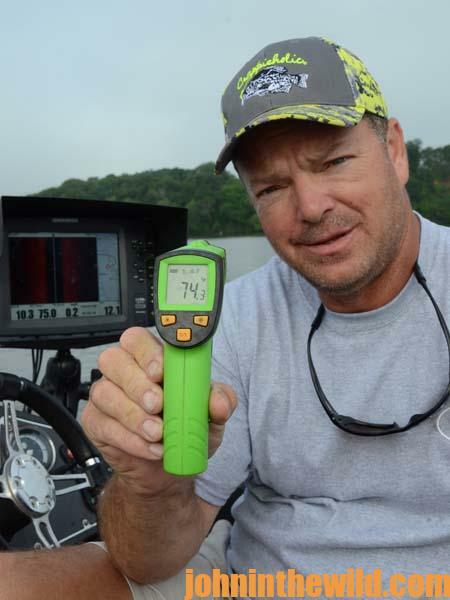 You also have to know what the water temperature is on the river system where you’ll be fishing. Then you can use ice packs to keep the water in the minnow tank 10-degrees lower than the water in the river. I like the Yeti cooler, even though it’s expensive, because it has a great sealing lid. Often if you get into rough water, some of your minnow water will slosh out, but with my Yeti cooler, I don’t lose any water from my minnows. The bubble system and the temperature of the water in the cooler remain the same all day long. 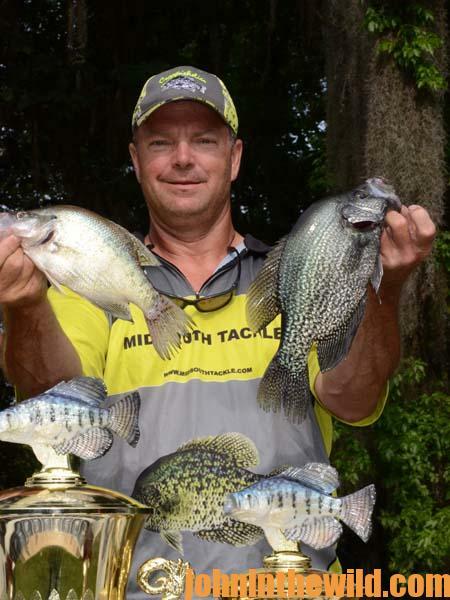 In July, 2015, we had a crappie tournament on the Alabama River, and the temperature was over 100 degrees. The weather was so hot that some of my plastic grubs melted on the deck of the boat. However, I kept my minnows cool and aerated. Because I had this oxygen system going to the tournament-size crappie I planned to weigh-in, I didn’t have a single fish die. 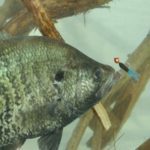 One of the secrets to learn the river water temperature and the water your minnows and your crappie are in is to use a laser temperature gun that you can buy at an automotive parts store. These guns are relatively inexpensive – about $30 each. I can point this laser temperature gun at the river and squeeze the trigger, and it gives me the surface temperature of the water. I can point the laser temperature gun at the water in my Yeti cooler to learn the temperature inside the cooler. Too, I can point my gun inside the live well to report the water temperature in the live well. If you don’t want to go hi-tech and pay the $30, you still need a thermometer that will tell you what the three different water temperatures are. The more-lively my minnows are, the more crappie I’ll catch. 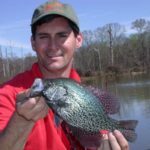 If a minnow is on your hook and is lethargic or acting like its half-dead, the crappie won’t be as interested in taking the minnow as they will be if the minnow is full of life and excited. 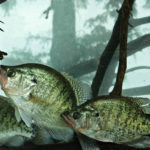 I’m often asked, “How does a minnow react when you’re fishing, and you drop it in that river water that’s 10 degrees hotter than the water in your minnow cooler?” During the hot summer months, the crappie will be holding in cooler water in what’s known as the thermocline. The thermocline is where the hot water of the surface meets the cooler water near the bottom, and that cooler water usually will be from 9-17 feet deep or deeper. The water temperature below the thermocline will be 10 degrees (or more cooler) than the water temperature above the thermocline. 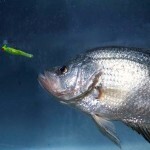 So, the minnow only has to make a short trip through that warm water, until it gets back into that cool water. Generally minnows don’t experience heat stress going through that warm water to get to the cool water. Because I’m a tournament crappie fisherman, we have to bring our fish live to the weigh-in, so they can be released. I run oxygen into my live well. I have a regulator on my oxygen bottle, so I can adjust the amount of oxygen I give to my tournament crappie. 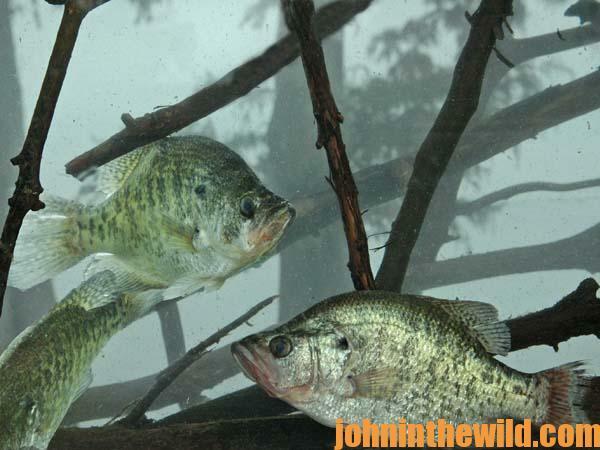 You can put out too much oxygen in your live well and kill your crappie. John’s Note: I met Steve Brown at the Bass Pro Shops’ (www.basspro.com) Crappie Masters’ (www.crappiemasters.net) Alabama Championship where the sponsors included: www.bobbygarlandcrappie.com; Black River Tools (www.blackrivertools.com); www.purefishing.com including Johnson Fishing and others; B’n’M Poles (www.bnmpoles.com); TTI Companies’ Fishing Group (www.tticompanies.com); Hampton Inn and Suites (http://hamptoninn3.hilton.com/en/hotels/alabama/hampton-inn-and-suites-prattville-MGMCFHX/index.html); www.elmoreco.org; www.gammafishing.com; and www.prattvilleal.com. To learn much more about crappie fishing, get John E. Phillips’ Kindle eBooks and some print books, “Crappie: How to Catch Them Fall & Winter,” “Crappie: How to Catch Them Spring and Summer,” “Catch Cold Water Crappie Now” and “Catch Crappie All Year: Fishing a Single Pole, Using No Boat and Farming Crappie” by clicking on each, or go to www.barnesandnoble.com.